Eggs! The wonderful protein –cheap, easy to prepare and versatile! You can poach, boil, coddle, bake or fry them. Fold them into an omelet or bake them in a casserole. Breakfast, lunch, dinner or snack, eggs are a perfect addition to anyone's diet. Why not eggs? Eggs are an important source of protein, vitamins, antioxidants and essential amino acids. Each egg contains six grams of protein, 4.5 grams of fat, (1.5 grams saturated /2 grams mono-unsaturated fat). A large egg contains 185mg cholesterol (in the yolk). To eliminate cholesterol, replace each whole egg with two egg whites. Fertile eggs are no more nutritious than non-fertile eggs. Eggs are very economical! About 18 cents each! To crack: tap egg firmly on flat surface (kitchen counter). Hitting egg on the edge of a bowl will drive bits of shell into the egg. Cracked/shelled eggs can be frozen, in an airtight container, for up to 1 year. Egg substitute or egg product can be purchased chilled or frozen. These are pasteurized, flavored, egg whites with added color. They do not contain cholesterol. The color of the shell means nothing---it is actually associated with breed of chicken—all egg are nutritionally identical. NEVER allow anyone to eat products containing raw eggs, e.g. cookie dough, uncooked eggnog, protein drinks made with raw eggs, etc. Cook eggs on low to medium heat for best results. Do not add salt to eggs prior to cooking as it may cause watery eggs. This time of year many families like to dye or color eggs. Be sure to follow food safety guidelines when using boiled eggs. Colored eggs must be refrigerated promptly after the color dries. 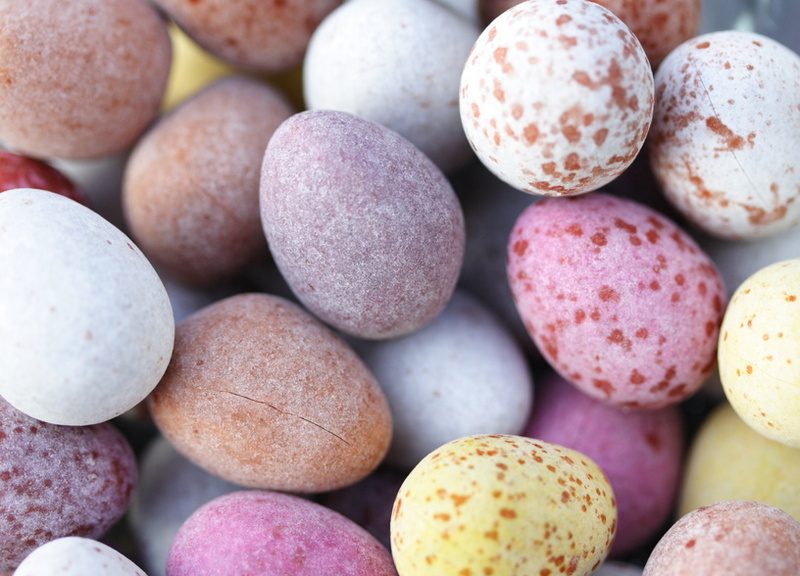 If using real eggs for an Easter egg hunt make sure the eggs are not out of the refrigerator for more than 2 hours. Or simply discard the eggs when the hunt is complete. Simmer uncooked eggs in water for up to 20 minutes with 1 tablespoon of white vinegar per cup of water and one of the following materials. Place eggs in a single layer in a saucepan and cover with 1 inch of cold water. Cover, bring to a boil and immediately remove from heat. Let stand 11-13 minutes. Remove eggs from water. Chill by immersing eggs in ice water before peeling. Just click on the youtube icon!